The acknowledged calculation method of marine airbag ship launching is never reported although every year more than three hundreds vessels are launched with marine airbags. 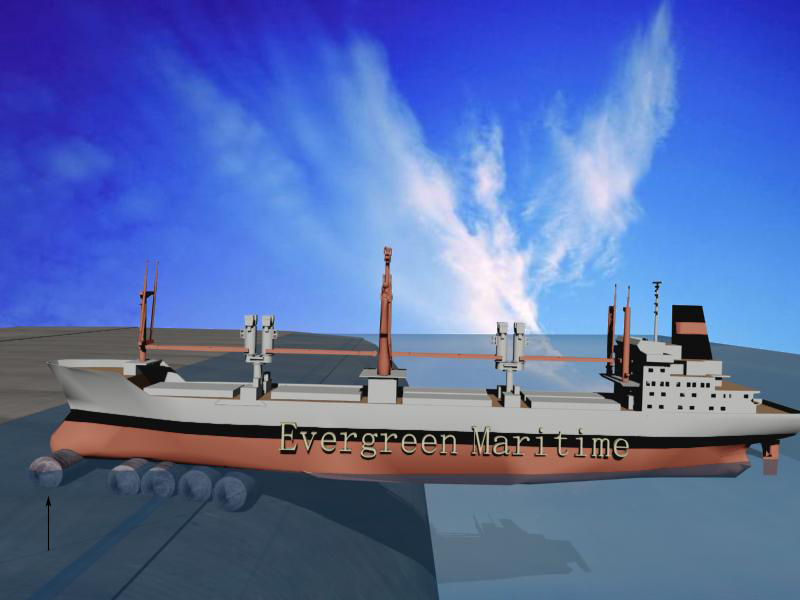 With the increasing tonnages of launched vessel, the ship launching calculation becomes to be more and more important. The items need to be calculated to confirm safety during airbag ship launching include, pulling force from holding system, airbags’ pressures during launching, vessel bottom’ bending moment, vessel’s floating condition, etc,. The holding system is deployed to prevent vessel from sliding while it is fully supported by inflated airbags. Two conditions should be satisfied to keep vessel balance on the ramp while it is jacked up by airbags: balanced force and moment. 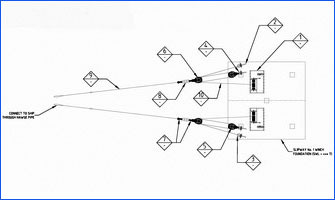 The lifting forces from airbags equal to vessel’s gravity force in vertical direction component, the friction force against ramp plus pulling force from winches equal to sliding force of vessel’s gravity. The balanced moment means the resultant rotation moment of airbags’ lifting force should be zero. The requirement of pulling force to hold vessel before launching is easy to determine once people know the friction coefficient of airbags against launch ramp. Those friction coefficients are different for different ground condition. For concrete ramp, the friction coefficient of airbags against ramp is 0.01-0.0125. For compacted natural ground, the coefficient is 0.0125-0.02. Generally the safe coefficient of pulling force should be 1.5-2.5. In the vessel jack up stage, airbags’ pressures will be controlled by inflating. By calculating the lifting up force from airbags people can know what airbags’ pressures will be needed. Generally speaking in this stage, airbags’ pressures will not exceed their safety working scope. 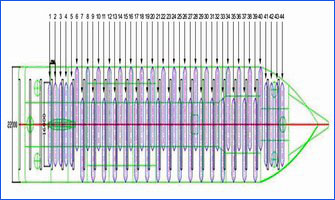 The sequence of airbag inflating is important in vessel jack up stage. 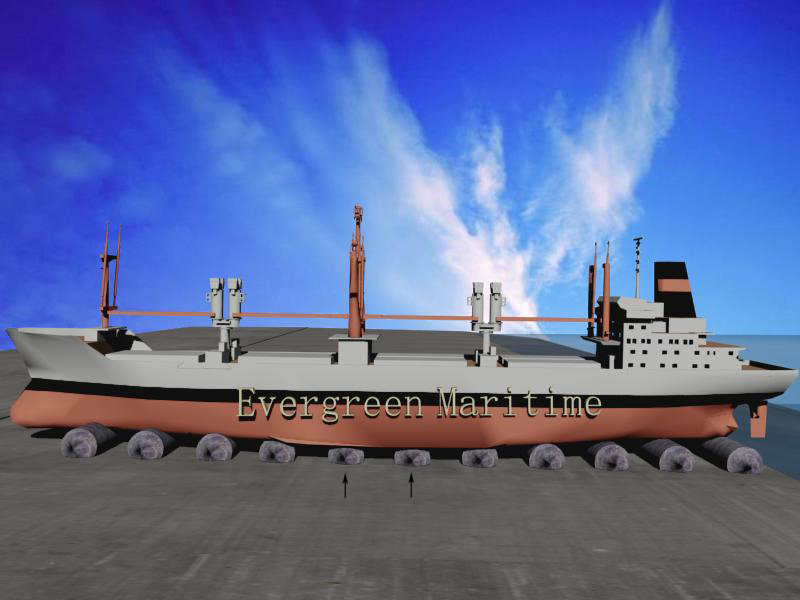 Improper operation may cause the vessel bottom bending, especially for barge launching with airbags. 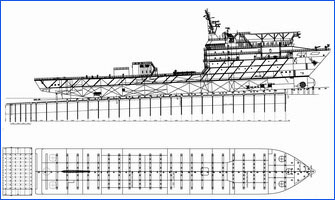 Barges have big dimensions but light weights, the bending moment caused by improper airbag jacking may damage barge’s bottom. For small vessel people can surely inflate all airbags at the same time which issue neglectable bending moment. But for big heavy vessel, generally one end of vessel will be lifted up first, which need the calculation to determine where to start airbag jacking up that will cause minimum bending moment to the vessel bottom. Once ship moves, people can not adjust airbags’ pressure by inflating or deflating operation. 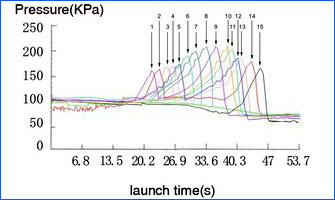 The arrangement of airbags’ pressure before final launching are very important to the launch safety. 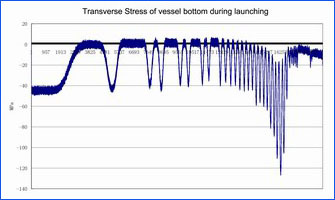 Due to vessel’s incline angle changing , airbags’ pressure and working heights change all along the launch. Airbags at some critical positions may withstand more than two times pressure increasing. In this stage most calculations are carried out by softwares. There is no standard of calculation of ship launching with airbags yet and the calculation based on our theory can only tell the scope of vessel’s movement. 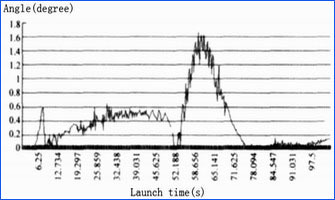 But by hundreds’ vessel launching, our calculation were tested to be satisfied. There are four main problems may happen during the airbag ship launching process. 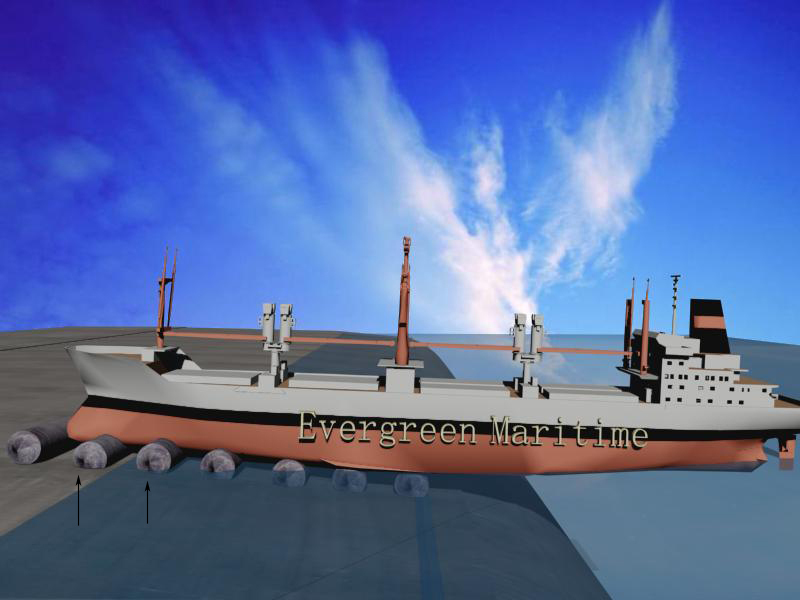 First, vessel’s stern may collide with the slipway or seabed if the water buoyancy has not lift stern in time. 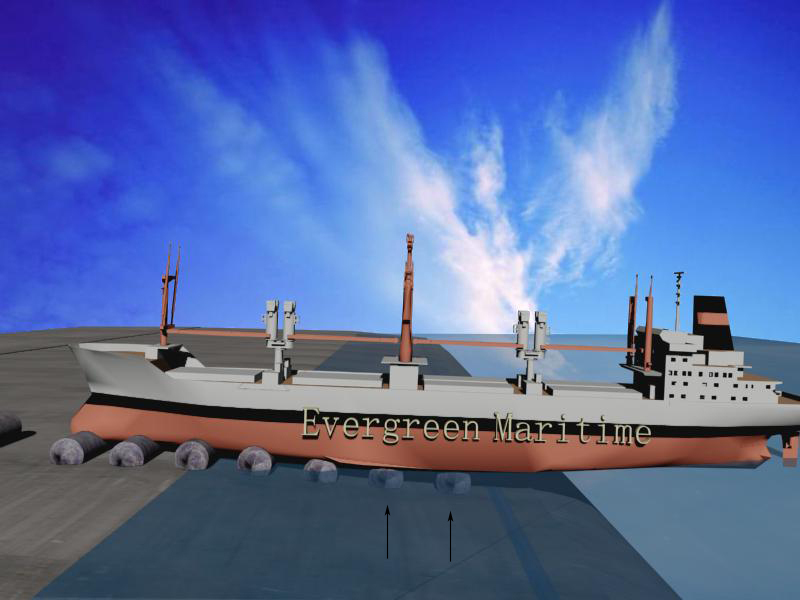 Second, vessel’s bow may drop to the ground when the stern is lifted and airbags under bow can not withstand the pressure. Third, vessel may get stuck in water by the friction of airbags that get stuck in the soft seabed. Fourth, vessel goes too far in water and may dash against the thither bank.